If you want to understand why Kevin Sharkey is Martha Stewart’s most trusted employee and best friend, consider how he treats his less famous companions: Once, for a cross-country drive that involved overnight stays in dingy motels, Mr. Sharkey brought along pillows, perfectly pressed D. Porthault linens and bolts of painter’s tarp. It’s all part of the philosophy he’s internalized over 23 years of working with the world’s most famous lifestyle guru: Things don’t have to be perfect. They just have to be close. Officially, Mr. Sharkey is the executive vice president and executive design director of Martha Stewart Brand Management for Sequential Brands Group. Unofficially, he is her deputy in all things. Of her 94 books, she has a co-author on just one: last year’s “Martha’s Flowers,” written with Mr. Sharkey. He is the only person other than Ms. Stewart to have been featured on the cover of Martha Stewart Living. He is typically the last person before her to approve a Martha Stewart project. And he has an apartment or room at all of her homes. Mr. Sharkey, 50, joined the media and merchandising lifestyle empire that is Martha Stewart in 1996, after working for several years as the assistant to the renowned decorator Albert Hadley at Parish-Hadley Associates, a design firm whose old-guard clientele included the philanthropist Brooke Astor. His name is familiar to readers of Ms. Stewart’s blog, and he has appeared often on her TV programs. (He also hosted a humorous radio show until 2015 on Sirius XM on gardening and design.) But few know how indispensable Mr. Sharkey is to the ultimate household name in all things household. Mr. Sharkey was raised in Boston, one of two boys in what he called “a traditional family.” He went to an all-boys Jesuit high school, and at home, there were Great Danes and holidays marked by extensive decorating. The big influences on his young life were his childhood visits to the Isabella Stewart Gardner Museum, his summer job at Harvard’s Arnold Arboretum and the Rhode Island School of Design, where he majored in architecture and established his pack of friends, many of whose children he godparents. Good taste came naturally to Mr. Sharkey, but he needed to learn the rigors and subtleties of running a business. Both of his mentors taught him that, away from the glare of the spotlight. He described Ms. Stewart as both a role model and a student of life. “She’s a teacher and she’s driven to learn,” he said. And he has a special power over Ms. Stewart. There’s only one thing he can’t do. “I don’t cook,” Mr. Sharkey said, standing in the gleaming white kitchen of his New York City apartment on Charles Street, which overlooks the Hudson River through floor-to-ceiling windows. Mr. Sharkey’s home, in a building designed by Richard Meier, reflects his understated taste and meticulous organization. A long corridor is lined with a color series by the artist Josef Albers, a gift from Ms. Stewart. The wall of his library is taken up by a photograph depicting tall firs and pine needle paths that lead to ponds at Ms. Stewart’s home in Maine. (She had it enlarged for him after he admired it on a photo shoot.) There are Blanc de Chine porcelain figures and wooden Guanyin sculptures, and low sofas and tables that allow for uninterrupted views of the Hudson. Mr. Sharkey entertains here; on any given night, friends cook or he orders pizza or Chinese food. The dining table becomes a table-tennis table. On Sundays, guests gather to watch movies in his building’s screening room. Everyone gets candy. “I don’t have a partner or a boyfriend,” he said when asked, and joked that press coverage could result in “marrying me off.” Work and socializing tend to run together for him, but, Mr. Sharkey said, he is most proud of his enduring friendships. “He has all these parties and I’m not included,” Ms. Stewart said jokingly from her Manhattan office, Mr. Sharkey sitting close by her side. “I have cocktail parties and I invite you!” Mr. Sharkey said in protest, a flush of pink coloring his cheeks. “I’m jealous of all of his other friends,” Ms. Stewart continued, with a twinkle in her eye. “They go off on their trips and he doesn’t invite me.” She listed the names of people with whom Mr. Sharkey takes an annual trip to Italy on July 4 — the only holiday they spend apart — while he sighed audibly and widened his eyes in showy yet amused exasperation. The two vacation often and adventurously together, sometimes with Ms. Stewart’s two grandchildren and her daughter, Alexis. There are safaris in Botswana and Zimbabwe, visits to the home of the designer Valentino Garavani, and private tours of the gardens at Tokyo’s Imperial Palace and Prince Charles’s Highgrove House. Mr. Sharkey also hikes with Ms. Stewart when her other friends refuse. “It’s very serious, his effect on my state of mind, in terms of personal things,” said Ms. Stewart, who describes Mr. Sharkey as her best friend and someone “who is not obsequious in any way, just fun and intelligent.” And her devotion to him is manifested in tributes. Ms. Stewart has named a French bulldog after him, as well as a leather tote, a shade of paint (“Sharkey Grey” was exclusively sold at Home Depot) and a cartoon character in a stiffly mannered children’s animated web series she created. Alexis’s children call Mr. Sharkey “Tio Kevin,” and pop in his apartment when they wish. He takes Jude to her dance classes and lunch on Saturdays and has a weekly “gentlemen’s dinner” with Truman, a soccer fanatic who is allowed to practice kicks at home and at Mr. Sharkey’s apartment, which is just below Alexis’s. “It’s like his house, and he can just walk in,” Alexis said. “He’s such a close friend of mine, I wouldn’t have it any other way. 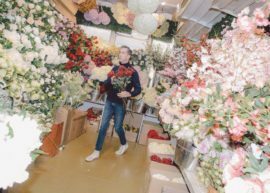 More than once a week, Mr. Sharkey peruses the outdoor flower market in Manhattan’s Chelsea neighborhood, looking for inspiration and gifts — because it’s always someone’s birthday. Mr. Sharkey has many other old-world manners, offering his arm to a woman on the stairs and writing thank you cards on good stock even after a casual supper. But his sense of humor tempers his Boston Brahmin accent, herringbone tweed coats with fur shawl collars, Thom Browne suits and tapered-toe leather shoes. So does his fondness for Fritos paired with caviar. There’s a photo that Ms. Stewart once showed on TV of him asleep in the bow net of a Chinese junk ship, clutching a beer bottle. “He is always very correct, very proper, but somehow remains a fun, little kid, who should be playing Puck in ‘A Midsummer Night’s Dream,’” Mr. Kleinberg, the designer, said. Mr. Sharkey’s office at Martha Stewart’s headquarters in Manhattan is technically windowless, but he says he has a “million views.” Hundreds of books are arrayed, floor to ceiling by color, and dozens of Martha Stewart employees work quietly nearby. The walls are pinned with images of sunlit gardens, sleek furnishings and salted caramel cookies. 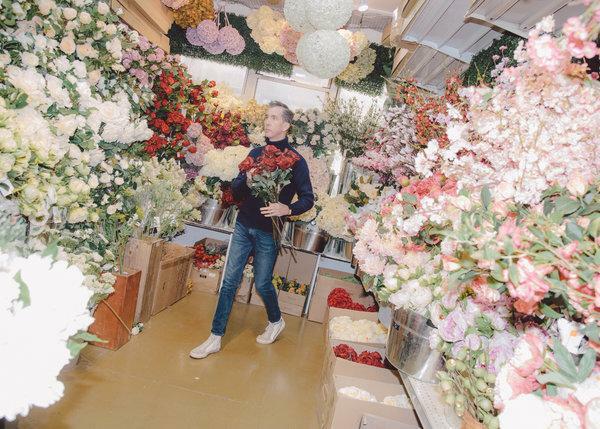 Darcy Miller, the former editor of Martha Stewart Weddings magazine, spoke of him as an office confidant and a candid colleague. “He can say things to her no one else can,” she said. For decades, Ms. Stewart endured snarky profiles about her craft projects and sendups of her perfectionism on shows like “Saturday Night Live.” These days, as the spare, natural-lit and handmade style she championed has been widely imitated — by Kinfolk magazine, Pottery Barn and others — Ms. Stewart appears to have the last laugh. She even owns and monetizes her caricatures. “Martha & Snoop’s Potluck Dinner Party,” an Emmy-nominated cooking show on VH1 with the rapper Snoop Dogg that has Ms. Stewart downing tequila shots, was renewed for a third season. And her surprisingly blue roast of Justin Bieber for Comedy Central, where she joked about surviving the five months she spent in prison beginning in 2004 after being convicted of lying to investigators about a stock trade, was a hit. At 77, Ms. Stewart — still a competitive business woman of “protean competence,” as Joan Didion once wrote in The New Yorker — walks a little slower, albeit in five-inch Prada booties. But she’s still expanding her empire, and also, has probably plowed four miles of snow from her farm in Bedford, N.Y., before you’ve switched on the coffee maker. In March, she announced she would advise a Canadian cannabis grower on hemp-based CBD for people and pets. And she has found other platforms for her merchandise: Last February, she missed her beloved chow chow Empress Qin compete (unsuccessfully) for “best in show” at the Westminster Kennel Club Dog Show in February because she was selling her trademark puffer jacket on QVC. Ms. Stewart giggled, looking pleased.